After a devastating earthquake struck Nepal on April 25 and killed over 7,000 people, relief efforts are desperately needed. However, although the epicenter of the quake was in the rural Gorkha district, destruction and death affected people all over the country, making it difficult for aid workers to provide relief. 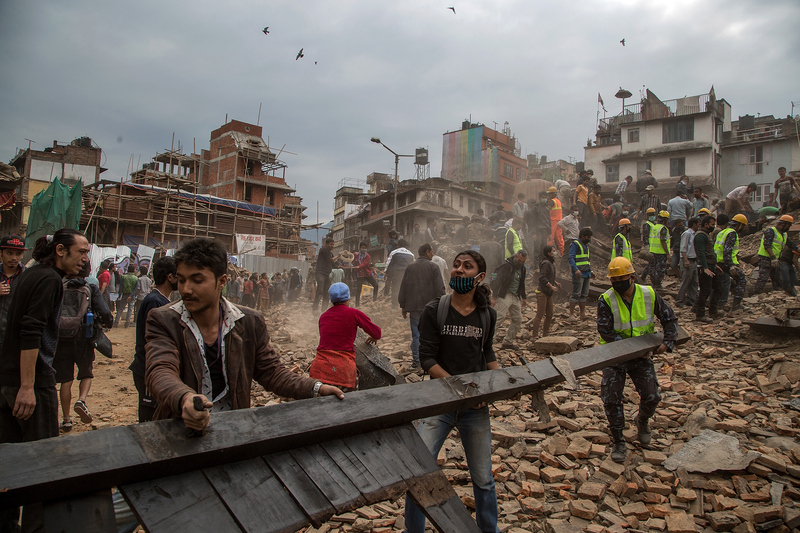 Though many countries have pledged aid, relief efforts in Nepal are still lacking and disjointed. Help is coming in slowly, but people in urban and rural areas still need more help, and key resources are at a minimum. Prime Minister Sushil Koirala said last month's earthquake showed the necessity of a new ministry to deal with natural disasters. Visiting Barpak in Gorkha, he said that although people are returning to their normal daily activities, villagers are still in need of basic food and shelter. Tents and foodstuff are in much demand here, and the government is coordinating with the neighbouring countries to deal with the post-quake situation. Koirala added that it was important to unify relief efforts despite political conflicts, and prepare for potential disasters in the future. We should bravely face the challenges in unison instead of harbouring pessimistic views. We are not very happy with the speed of the work. The people are very patient and reacting with no anger. They are deprived but I am surprised how calm they are. I am quite optimistic that in due course of time things will be better. Indeed, some villagers are reacting with anger as relief efforts come and go without stopping to help them. At the entrance to on one isolated mountain village called Pauwathok, villagers have created a sign out of debris that says, "WE NEED HELP. PLEASE HELP." Many people are still missing as a result of avalanches triggered by the earthquake. Rescuers working to find bodies with helicopters have been hampered by bad weather. It's not that the government isn't trying, it's that they've not been able to reach everywhere. Koirala said the government will meet Thursday to discuss the formation of a separate natural disaster ministry. Koirala added that rehabilitation of damaged buildings will only begin after distribution of basic supplies has been completed. Everything is completely destroyed and they need everything, they need shelter before the monsoon. In Barpak, many people are still missing, search and rescue teams are still finding bodies in the rubble. Of the town's 1,450 buildings, only about 250 are left still standing, The New York Times reported. The vast numbers of newly homeless people in Nepal have created a demand of about a million tents, a demand that the government has not been able to meet. Over 131,500 Nepalese military and police workers are taking part in relief efforts, as well as over 100 foreign teams. The estimated need is for 500,000 tents by the end of the week. The government thinks that with current supplies they can obtain 300,000 rectangles of canvas, and are uncertain where the rest will come from. So what's holding up these relief efforts that are so clearly needed, and which many countries — 34, to be exact — have pledged to provide? Many people blame bureaucratic interference on the part of Nepal's government. Bureaucratic problems have stunted relief efforts and delayed cash aid. The government has asked all 34 foreign teams to leave the country. Aviation authorities have also stopped the landing of planes carrying large amounts of aid materials for fear that the airport may be further damaged.